A diverse range of playground activities is also important to keep kids active, which improves motor skills [PDF] and combats childhood obesity. In a study of schoolchildren in Denmark, concrete play areas encouraged much less movement than other playground types. Children playing on paved surfaces that weren’t marked for any specific games, like basketball, tended to stay sedentary, while kids moved more on grass and play equipment. A 30-foot-tall climbing pyramid (taller than most two-story homes) in Saratoga Springs, Utah opened in 2012.The pyramid’s structure is metal, and rope netting inside prevents kids from falling more than 6 feet. It designers tout it as the largest play pyramid in the western hemisphere. 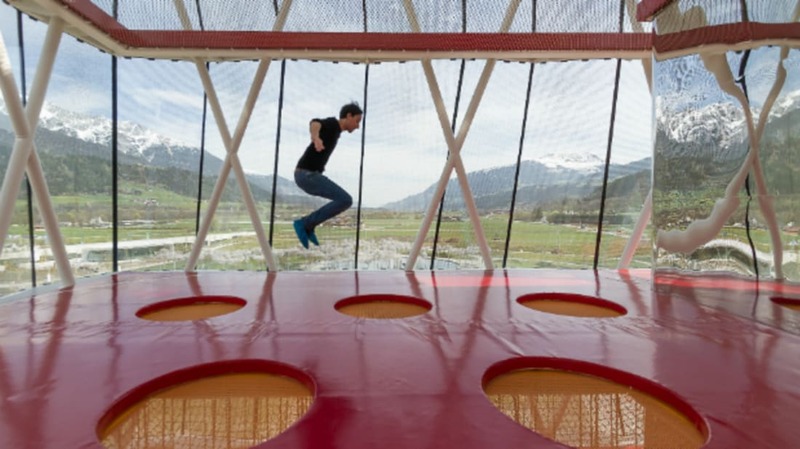 Kids may not care about the history of the Austrian crystal company Swarovski, but the company museum offers a playground that makes any tour worthwhile. The four-story play tower features a trampoline, rope swings, a 45-foot-tall climbing net, and slides. This Australian playground is designed for children of all abilities, including visually impaired and wheelchair-bound kids. It’s got a 40-foot climbing tower, a 30-foot spiral slide, a zipline, wheelchair-accessible swings and a play boat, musical play equipment, and more. At this playground in New York City, designed by acclaimed architect David Rockwell, kids make their own fun. This minimalist park is designed to get kids playing with little more than sand, water, and a set of blocks. Kids can stack, connect, and maneuver the abstractly shaped blue blocks into new playthings. In Nagasaki, Japan, a multi-story urban school provides a new way to have recess. A playground on the roof deck of a school designed by architects Hibinosekkei has a climbing net that leads up from a playroom downstairs. Inside, there’s even a fireman’s pole to slide down! This Washington, D.C. playground is math-themed, taking its design inspiration from the Fibonacci sequence, a numeric pattern in which the next number is always the sum of the last two. The curves of the paths and play equipment are shaped in Fibonacci spirals. In a quest to create the playground of the future, the Shelby Farms Park Conservancy in Memphis built a park within the woods where kids have to “look for opportunities to slide, climb, run, scramble, swing, build, find and discover,” according to the designers at James Corner Field Operations (also the architects responsible for Manhattan’s High Line). The designers worked with the input of local kids to determine how they wanted to play. The result is a playground separated into different “play nests” with slides, treehouses, climbing nets, sand, and more, all connected by a winding walkway covered in ivy. Inspired by the junk playgrounds proposed by Danish architect Carl Theodor Sorensen in the 1930s, this Welsh playground is filled with trash. Largely unimpeded by adult supervision, kids play with hammers, climb trees, build dens, and light fires. The idea is that “adventure playgrounds” allow kids to learn how to take risks and cooperate with each other in ways that playing on a low-slung slide with a watchful adult hovering nearby does not. The trailer above comes from a documentary film about the playground that premiered this past April. The New York Hall of Science’s Science Playground in Corona, New York is the largest of its kind in the country. The 60,000-square-foot outdoor play space is designed to let kids explore motion, balance, and simple machines. Kids can play with waterworks, clamber up a giant spider web, ride a giant seesaw—and of course learn the physics behind it all. Designed to accommodate a large number of kids in a small space at a school in Purmerend, the Netherlands, Wallholla is the playground equivalent of a skyscraper. The structure packs a lot of activity in a space only a few feet wide. Ribbon-like platforms run throughout a wire mesh cage that 30 kids can climb in, out, and around at the same time. The structure is now being sold in the U.S., too. Danish playground designers Monstrum created this indoor playground at the Danish Railway Museum, inspired by the local railway station in the town of Odense in the 1960s. The locomotive-themed playground has a ticket office, a control tower, a train with passenger carriages and an explorable engine compartment, and more. Monstrum is also responsible for this awesome forest playground at Klehund Dryrehave, a former hunting plantation in Denmark. There’s an 8-foot-tall slide shaped like a giant ant, an anthill to climb, a “lumberjack hut” to picnic in, and a 65-foot-tall watchtower to hang out in. 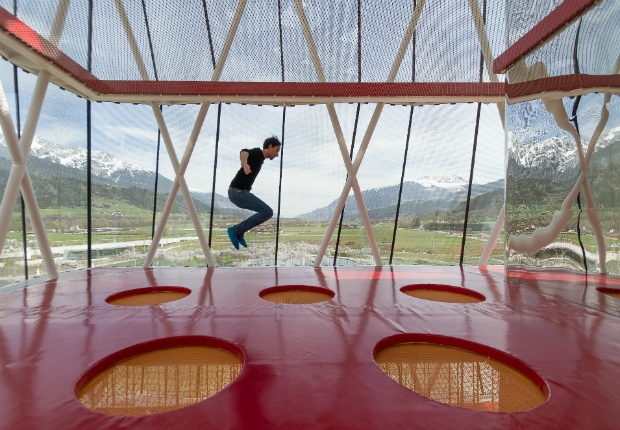 At Zip World in northern Wales, a Victorian slate mine has been converted into an underground playground with giant trampolines and bouncy nets connected by walkways and slides. The cavernous subterranean play space has different levels, with the highest chamber 180 feet from the floor. This past year, they introduced a kids’ experience that’s designed for young ‘uns 3 to 6 years old. St. Louis’ City Museum is essentially one big giant playground. Inside, it has a giant treehouse and a 10-story spiral slide that you can use to whoosh into the building’s basement. Outside, there’s a 30-foot-tall Ferris wheel on the roof, multiple airplanes you can crawl into, a rope swing, and more. Playgrounds don’t have to be just for kids. The Green Heart, an outdoor gym in Kingston upon Hull, England, is an adult playground. It has stationary bikes, step boxes, cross trainers, and more. The grown-up jungle gym is human-powered—it glows at night using energy generated by using the gym equipment.